I am having a blast exploring the diversity of neighborhoods that make up the great city of Toronto. Helping me navigate around the city – and helping me plan before I arrived – is the DK Eyewitness Travel Guide: Top 10 Toronto. I love the DK Eyewitness series and this volume is just what I needed to scope out the perfect visit to Canada’s largest city – just enough information to wet my whistle to want to explore more. With a slim size that fits into a pocket and handy pull out maps, the DK Eyewitness Travel Guide: Top 10 Toronto is the perfect touring companion. 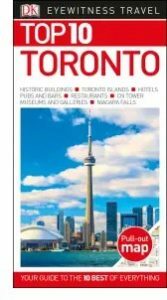 DK Eyewitness Travel Guide: Top 10 Toronto is available from Amazon and other fine booksellers everywhere. Lost Cowboy is powered by	WordPress 5.0.4 and delivered to you in 0.858 seconds using 45 queries.